Hi everyone. I'm back at trying more watercoloring ... I struggled a bit with this card ... not only with the watercolored flower, but what to use for the backdrop. In the end, the card is fairly busy and not my usual CAS style, but I'm pretty happy with how it turned out. This is for a friend that is recovering after a horrific time in the hospital. I hope my card will bring her a little joy. This is also for the challenge at Darnell's blog (djkardkreations). If you haven't visited Darnell's blog yet, please do - you'll be glad you did. Not only is she a creative card maker, but she has a wonderful sense of humor and is a lovely, supportive, crafting friend to many. Which brings me to the reason for this challenge on her blog ... she is celebrating 500 followers! :) Wow ... congrats Darnell (Dolly to me)! 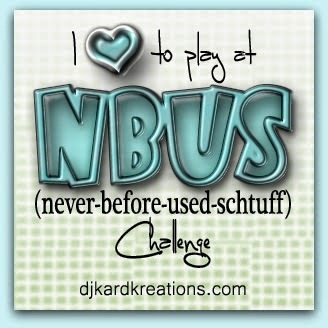 :) She has coined the saying "NBUS" - never-before-used-schtuff! and it has caught on in the card making blog-o-sphere. The challenge is to use a NBUS and to celebrate friendship. Here's the link to the challenge ... come and play along! 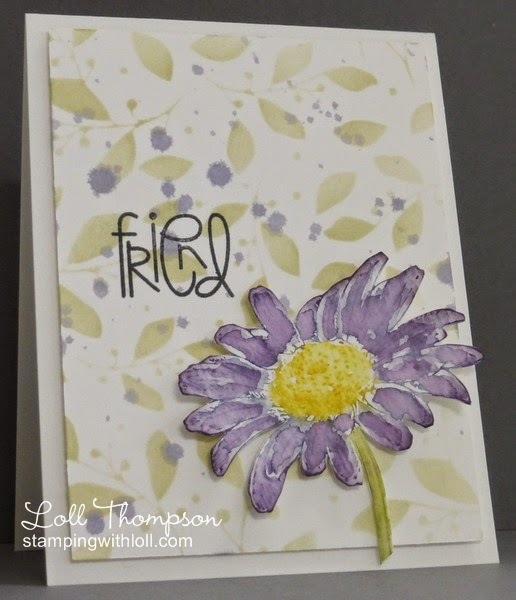 The stencil I used for the background and the flower stamp are NBUS. As well, I don't think I've used the Wisteria Wonder ink before either ... so three NBUS items on this one card! This doesn't look like you struggled, Loll. It's gorgeous and I'm sure will bring joy to your friend! I tried splatters the other night and it was a disaster! I was able to camouflage them a bit, but I wasn't happy. The flower I'd watercolored was really pretty and then I messed up the background. Frustrating. But still having fun with it. Very nicely done card...I'm sure it will help to bring some cheer your's friend's way. Way to go - stepping out of your usual style! I really like the card! I have a NBUS stamp set that I was thinking of inking up for the CAS challenge so I'll enter it in Darnell's challenge as well. You struggled? I would have never known...this is so pretty! All that matters is what a smile it will bring to your friend! Beautiful! Great card Loll and I am sure it will be loved by your friend. I especially like how you did the background. Love the colourway you've used here Loll and that flower looks so realistic. I'm sure it will give your friend comfort after such a bad time. This is a bolder busier card than your normally do, Lolly, but I have to say I am fascinated by it and love it! One of those cards you can't stop staring at! That background looks like patterned paper that I'd buy in a minute. It reminds me of the beautiful exquisite handmade papers from India. And the Gerbera, please! It is so beautifully watercolored and the way you have it on your card makes it look 3D and touchable! Well done. Water colored nicely too. A cheerful card. It's Wonderful Loll! It is sure to brighten your friend's day. I love the peaceful colors and she will too.